The Turkey Derby is set for this weekend at Wall Township Raceway (NJ) and a full field of racecars are expected for the event. It’s hard to imagine a big race at Wall without the Brothers Blewett, so expect John, III and Jimmy to be strong in Saturday’s big race. Race of Champions Modified champion Matt Hirschman also expects to enter and as we’ll see a little later on, NASCAR Whelen Modified Tour standout Donny Lia is heading to Jersey looking to have some fun at the track. There will be a dozen features taking place at the track on Friday and Saturday. This will be the final major outdoor short track event of 2005 in the Northeast, so bring a blanket to watch the Modifieds this holiday weekend! One of the Nice Guys of New England racing in recent decades has made news in the past week for two different reasons. Goodwin Hannaford was inducted into the Beech Ridge Motor Speedway Hall of Fame at their annual banquet for his efforts as a long-time engine builder for countless competitors at the track. Hannaford was in good company. NASCAR Busch North champion and former Ridge runner Brad Leighton was also feted for entry in the Hall of Fame. Ironically, Leighton drove a limited season in a Modified for Hannaford over a dozen years ago and posted some pretty good results. Hannaford also announced this week that he is taking some time off from his role of a car owner. Hannaford and his wife Anne have fielded a True Value Modified Racing Series entry with Jim Boniface behind the wheel, but will step back from that in 2006. Both Hannafords say that they will be returning to the track as fans throughout the year, so we hesitate to use the “retirement” word for their situation. Chances are that they will be back with their racecar before too long, so hiatus would be much more appropriate. One of the cornerstones of NASCAR Touring racing in New England, Stafford Motor Speedway, has announced their 2006 schedule. The NASCAR Whelen Modified Tour will return to the track for four dates in '06 and there will be a single NASCAR Busch North Series event at the track on June 16th. 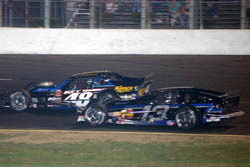 The 35th annual Spring Sizzler will kick off the track’s action next year and will be the first of the Mod Tour shows. That event is scheduled for April 28th-30th. The other Tour shows will consist of two Friday night shows on May 26th and August 11th and the annual Fall Final to be held September 29th-October 1st. Another popular highlight of the Stafford season will be the return of the Extreme Tuesday on July 11th, which features races for the ISMA Supermodifieds and NEMA Midgets. At last season’s Turkey Derby, Lia finished second to hometown hero and Modified Tour standout John Blewett, III so winning is definitely a realistic option for the #18 team. This weekend’s Turkey Derby at Wall Township Raceway (NJ) means something a little bit different for Donny Lia and his #18 Lia Motorsports team. Going there is not about collecting points, turning heads or making headlines. The Thanksgiving weekend classic is instead all about Lia and his team enjoying themselves after a grueling season of NASCAR Whelen Modified Tour events and several open shows at tracks from Massachusetts to North Carolina to Florida. The Turkey Derby will feature teams that race weekly at Wall, as well as several from the NASCAR Whelen Modified Tour and Race of Champions Tour. It’s even possible that a team or two from the True Value Modified Racing Series and NASCAR Whelen Southern Modified Tour could show up.